man, Fitter, Molder, Supervisor and Earth Work Mistri posts in Irrigation and Water Resources Department. The eligible candidates may apply online on or before 10-05-2016 through the official website of HSSC @www.hssc.gov.in. Online applications only allowed for this recruitment. Selection for this Irrigation and Water resources department recruitment will be held based on written test and personal interview only. For more details regarding this recruitment of Water resources and Irrigation department posts please see the information given below. Click here to see the official advertisement of Haryana Staff Selection Commission Water resources and Irrigation department Recruitment. Those who are applied in previous recruitment notification which is recruitment process is not conducted. They are also eligible to apply for this current recruitment of HSSC. There are total 423 vacancies available in Haryana SSC Irrigation and Water Resources Department. All the above posts preference will be given to the experience candidates. For all the posts must have matriculation with Hindi/Sanskrit or Higher Secondary with Hindi/Sanskrit. The candidates must have ITI in their relevant field with two years of experience. And 6 months certificates in computer applications. The candidate age limits are for all the posts are 17-42 years. Age limits relaxation will be given as per Haryana government norms. The eligible candidates have to apply through online only using the HSSC official website @ www.hssc.gov.in. Before applying online must have read the official notification and instructions to apply online. The candidates have to pay the application fees online using credit/debit card or net banking or offline taking print out of e-chalana of State Bank of India, State Bank of Patiala, Punjab National Bank and IDBI Bank etc. The candidates have to upload the all necessary documents at the time of online interview such as date of birth certificate, Qualifications, Community, experience etc certificates. Selection for this HSSC Irrigation and Water Department recruitment will be held based on written test personal interview. The candidates will be shortlisted for interview based on the marks secured in written test. At the time of personal interview along with the printed copy of application the candidate have to bring the identity Proof i.e. Identity Card/Driving License/passport/Voter Card/PAN Card/Aadhar Card etc along with Photo and all testimonial of educational qualifications and community certificate. 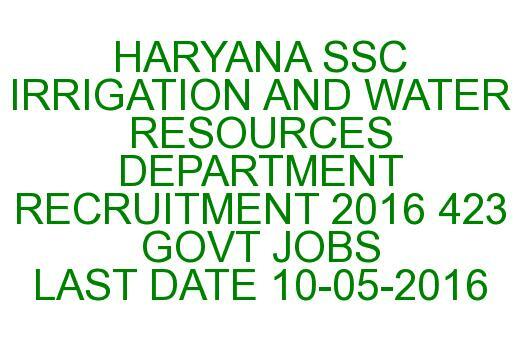 Click here to apply online for the Haryana Staff Selection Commission Irrigation and Water Resources Department Recruitment2016. Please share this HARYANA SSC Irrigation and Water Resources Department Recruitment 2016 article to your lovable friends through online via social web.